This article is only partly correct. The store is considering closing its stores, at this point they have not made a decision if they are closing all, any or how many if they do. This is a very biased article, not taking in consideration the savings provided in food purchases to thousands of struggling American families. Fresh & easy has great prices for healthy food choices, including organics that families might not otherwise afford to buy. In addition to great pricing they also provide great coupons. I as well as many of my family and friends, will be very sad if the f&e doors close. Instead of basing your article on Union provided info and numbers, you should interview the public on the street. As others have pointed out, this article has some factual inaccuracies. I love Fresh and Easy and I would hate for it to close. The clerks there are very friendly and always willing to assist. You dont get that kind of assistance at Walmart. Lets support this market. 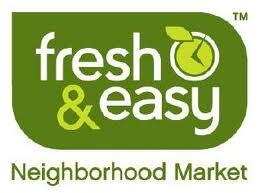 Fresh and Easy was always a Trader Joe’s wannabe. Sure the clerks are “very friendly” but you always go back for the FOOD, not the smile. A “friendly clerk” doesn’t make the belly happy … food does. Ummm, Tesco was started in 1919, long before Joe decided to start trading. If you were a travelin’ man, Joe (this is confusing), you’d know that the Tesco you get in England is a close relative of the Fresh & Easy down the street–same check out, same bakery and deli selections, same bagged vegetables. So it’s really a Brit thing, Joe, and it’s brilliant! Trader Joe’s is okay (whatever), but it doesn’t carry my husband’s favorite ham sandwiches–the kind we got on our travels through Europe. The clerks are just a bonus, Joe, seriously, it’s all good from the prices to the pumpkin muffins! And Fresh & Easy, please don’t go! I’ve honestly never gotten excited about a grocery store until I met you! they are both British stores…but I do favor TJ’s, but FAE has grown on me, but if they close the one in my neighborhood, I better see TJ’s opening the doors next! What’s with all the F&E bashing? It’s a great alternative to TJ’s, and I love not waiting in line and being able to do my own checkout. And the food is delish. Nothing wrong with TJ’s either. There is certainly room for both.